Photograph: Kwaku Alston - see end of article. 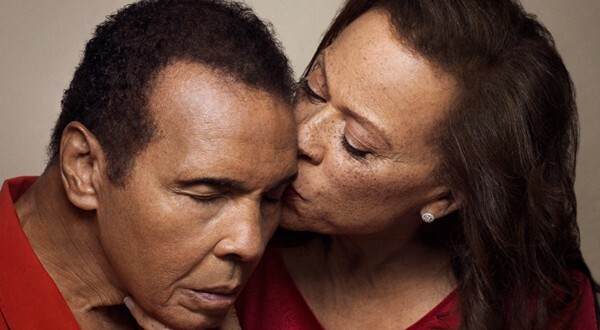 Muhammad Ali, the world’s greatest heavyweight boxer of all time, is spending his 73rd birthday at home with family and friends today, a day after being discharged from hospital where he had been in intensive care. The boxing hero was admitted to hospital in Louisville last month on December 20 with what was initially diagnosed as pneumonia. Doctors later re-diagnosed the condition as a serious urinary tract infection. He was treated in hospital for two weeks, mostly in the intensive care unit, and discharged early January. He was readmitted earlier this week when symptoms reportedly reoccurred. 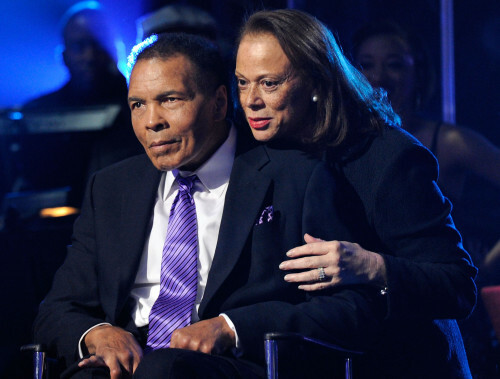 Ali, who retired from boxing in 1981, has been suffering from Parkinson’s disease for three decades. Medical sources say that pneumonia is one of the most dangerous conditions for sufferers of Parkinson’s, and one that is often fatal. Muhammad Ali, who was born Cassius Marcellus Clay Jr. on January 17, 1942 started boxing when he was just 12-years-old. He has two sons (one adopted) and eight daughters (some illegitimate), and is married to his fourth wife, Lonnie (born Yolanda Williams) who, by all accounts is totally devoted to him. He changed his name to Muhammad Ali after converting to Islam in 1964. Lonnie, previously a Catholic, has also converted to Islam. Ali, who is still larger than life, in spite of his illness and much publicized paralysis, loves birthdays, and is described by Lonnie as “a big kid.” When he turned 70 three years ago, the celebrations were legendary, with at least five parties held over several months in Ali’s hometown of Louisville, as well as in California, Las Vegas and Arizona. It is not known exactly how the now mute Muhammad Ali will be spending his day. But at least he is in the comfort of one of his own homes. Note: Kwaku Alston met Muhammad Ali when he worked for Oprah magazine.